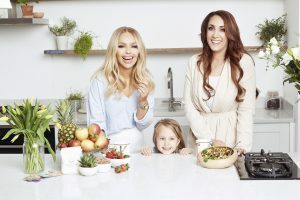 Katie Piper and weight-loss guru and mum of four TerriAnn Nunns, of The TerriAnn123 Diet Plan, are thrilled to announce the launch of their diet, fitness and lifestyle mum-manual, The Healthy Happy Mum Plan. The Healthy Happy Mum Plan is designed to help mums get back to looking and feeling their best, with both Katie and TerriAnn providing useful hints, tips and anecdotes on all things post-pregnancy, including embracing the changes in your body, breastfeeding and coping with sleep deprivation, relaxation techniques, mindful eating and easy-to-follow home workouts. Above all, The Healthy Happy Mum Plan includes a bulletproof, dietitian approved programme filled with delicious recipes that the whole family can enjoy, whilst still guaranteeing incredible weight loss results. Since the birth of her second daughter and whilst on the plan Katie has so far lost 2 stone, and TerriAnn has also lost an incredible 7 stone since the beginning of her own weight loss journey. A well-rounded guide, The Healthy Happy Mum Plan assists all mums in making better choices – whether you are a new mum or your baby is 30, it is an adaptable and sustainable weight-loss programme that helps and supports all women in reaching their goals. Following a simple 16:8 eating rule, where you eat within an 8-hour window, the diet plan gives 1,500 calories a day with no restrictions regarding specific food groups, and tasty recipes including Lemon and Poppyseed Pancakes, Chicken Noodle Soup and Spinach and Lentil Curry. To avoid over-indulging and keep you focussed throughout, once a week you also get a ‘Treat Day’ where you can consume up to an additional 500 calories. The plan means you can get the whole family involved and never need to worry about going hungry, perfect for busy mums and tried-and-tested by Katie herself! The Healthy Happy Mum Plan helps you stay on track with pull-out recipes, food diaries and workouts. Those who purchase also receive access to the Mum Hub, a Facebook community created by Katie and TerriAnn Nunns where members can share their thoughts, feelings and experiences and gain advice and reassurance from other like-minded mums alongside exclusive video content. Both Katie and TerriAnn, together with a consultant Dietitian and other health professionals will also regularly be online to answer any questions or queries from members.